Al Franken, Democrat Senator of the State of Minnesota. Source: Twitter. A woman accused on Thursday the Democratic Senator from Minnesota, Al Franken, for having "groped and kissed" her without consent in 2006. The media commotion caused by complaints of sexual harassment against multiple personalities (especially male ones) hasn’t spared the Democratic Party in the United States. You don’t need to delve much to know that this type of behavior does not distinguish class, race or political party. After the scandal that has put in check the Republican candidacy of Roy Moore to the Senate in Alabama, it’s now the turn of the blue party. It was Leeann Tweeden - news anchor at TalkRadio 790 KABC in Los Angeles - who made her terrible experience public through the radio's website, accusing the then comedian Al Franken of lewd behavior against her, before being elected as senator in 2008. Both met on a trip by the United Service Organizations (USO) to visit the Armed Forces serving in the Middle East in December 2006, along with other personalities such as Darryl Worley and Keni Thomas. 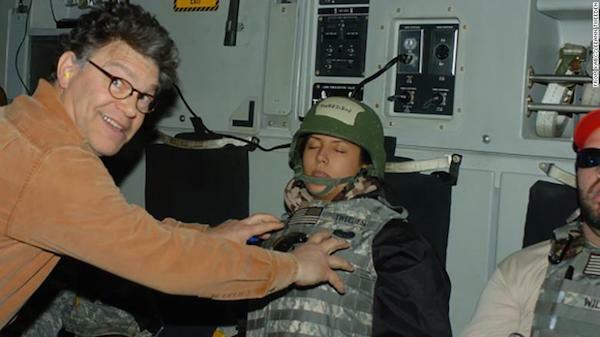 Franken attended as a comedian and organizer of some shows to entertain the soldiers that Tweeden describes as "full of sexual innuendos geared toward a young, male audience". Despite not being scheduled to participate in the script, Franken insisted on having "written a part" for the announcer, who finally agreed to play it. When reading her part, she realized that she should kiss with the comedian and supposed that she could improvise and avoid it, but the day of the presentation she was cornered by Franken who was insisting on "practicing" the kiss. The announcer claimed to have gotten out of the arms of the comedian feeling "disgusted and violated" and not having denounced him to avoid “causing problems", but made sure not to have contact or be alone with him for the rest of the trip. But the harassment didn’t stop there. During the 36-hour trip back to Los Angeles, Tweeden fell asleep on the flight from Afghanistan with her vest and helmet on. Upon returning home and seeing the courtesy photos of the trip, an image appeared in which the now senator groped her while she slept. "I felt violated again," he said. "Embarrassed. Belittled. Humiliated." Image posted by Leeann Tweeden. Despite her need to report it, the anchor confesses she didn’t do it because of the fear of reprisals and the consequences it could bring to her career. "But that was then, this is now. I'm no longer afraid," she said. With the support of her colleagues and her family - and the media impulse since the case of Harvey Weinstein - Tweeden has decided to speak "not just because 2017 is not 2006, or because I am much more secure in my career now than I was then, and not because I’m still angry. I’m telling my story because there may be others (...) I want the days of silence to be over forever. " For his part, and in a statement to the media, Senator Franken said he doesn’t “remember" that there was a forced kiss, but said he regretted his behavior, as reported by CNN. "I certainly don't remember the rehearsal for the skit in the same way, but I send my sincerest apologies to Leeann," Franken said. "As to the photo, it was clearly intended to be funny but wasn't. I shouldn't have done it." In a later statement, the Senator extended his apologies assuring "to respect women and not respect men who don’t" and "the fact that my own actions have given people a good reason to doubt that makes me feel ashamed." For Senator Patty Murray, however, Franken's apologise "doesn’t reverse what he’s done or end the matter". She also agreed with the majority leader in the Senate, Mitch McConnell (R-Kentucky), who said that the ethics committee should evaluate the matter.